When I heard about the “Your Brain on Art” call for submissions I was instantly intrigued. The Branch Out Neurological Foundation would pair artists with neuroscience projects to create a new work inspired by the brain research. I have been including science in my art since University when my interest in sound waves began. I have also been using brain imagery in my artwork since my B.F.A. I am captivated by the connection between brain science and our human experience. I was ultimately accepted and paired with the neurologist Taylor Chomiak and his research on “Music Training Biofeedback.” The project titled, “Ambulosono” offers Parkinson’s patients wearable-sensor systems that link motor action with rewarding musical feedback. I met with the neurologist to discuss his research. He showed me videos of his patients walking before his interventions. Many people with Parkinson’s experience a shuffling type of walk or even the stoppage of walking all together. The patients then chose a piece of music that related to them emotionally. This music was played for them and they were again asked to walk. The change was astounding. For one gentleman, he was able to start walking with a natural gait, dancing alone and even with his wife! It was clear how the music impacted their ability to walk normally again. As we continued to talk, Chomaik showed me another video and shared the story of a lady who also suffered from shuffling and stoppage of walking. She chose the song “Dancing Queen” for her exercise as it reminded her of the good times of her youth. With the music playing, she was able to walk normally. Without it she struggled, shuffled or stopped half way. I was curious if the type of music made a difference in the results. Taylor explained that it indeed did make a huge difference. He showed me the same example of the woman walking to “Dancing Queen” but with the melody removed and only the beat playing, similar to a karaoke sound track. She was no longer able to walk normally like she did with the full song playing. It became clear that the emotional component of the music was important as well as the connection of the song to the person’s memory. This story was so inspiring to me and I decided to use it for my artwork. 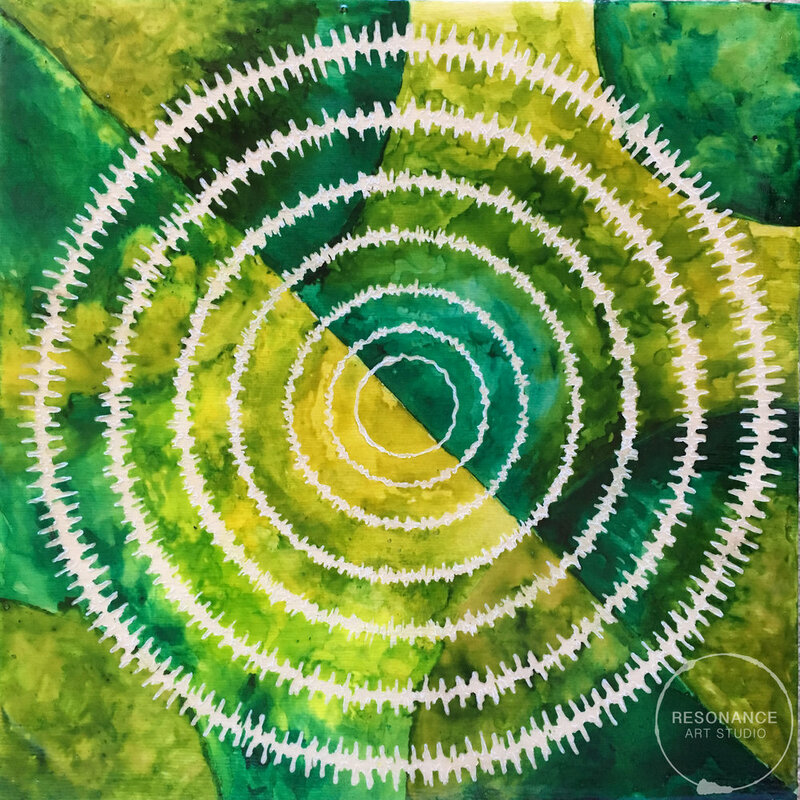 In my artwork, I have represented the song “Dancing Queen” by Abba using sound waves in circular form. The left sides of the circle are sound waves from a karaoke version of “Dancing Queen” without the melody. The right side sound waves are from the original song. I have used colours in the background to represent the brain scans of a Parkinson’s brain (left) and a brain responding to music (right). On top of the piece are two linear graphs, which represent the change in velocity and acceleration of someone walking to the different kinds of music. You can see how the walking stride becomes longer and more regular when listening to the emotionally connected music (right). 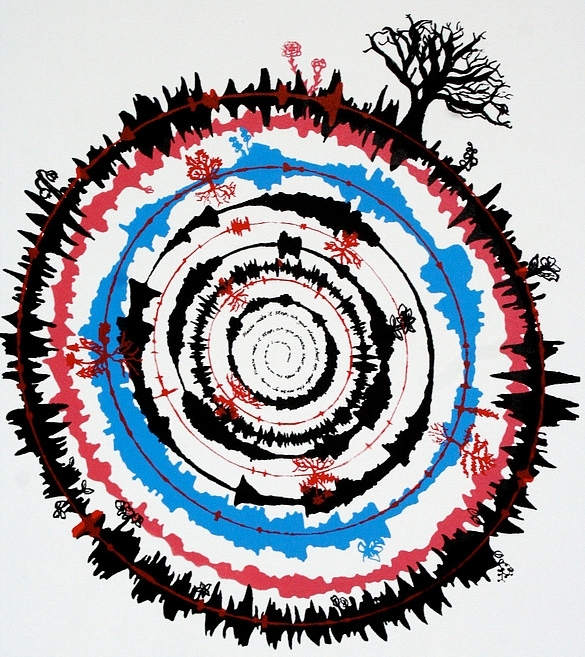 This piece represents how music, emotion and health are intertwined. "Dancing Queen" will be displayed at cSPACE on the first floor gallery from May 14-18. The online auction on Bidding for Good opens May 7 and closes May 17. There will be two evenings of entertainment on May 16 & 17 from 7-9:30pm. I became fascinated with the chakras when I started my Yoga Teacher Certification this year. This interest led me to research more about these centres in the body. I have learned about their spiritual and scientific significance. In addition, I have made connections to theories of sound and healing. I created art to visualize the association of the chakras to specific frequencies of sound that balance and heal each energy center. I will explore some of my research into the chakras, sound frequencies and cymatic patterns. First, what are Chakras? The word Chakra simply means “wheel.” Chakras are energy centers in the body that correspond with specific organs and help regulate its processes. Each chakra has it’s own vibrational frequency and associated colour. The chakras are as follows from top to bottom: Crown (purple), 3rd Eye (violet/blue), Throat (turquoise), Heart (Green), Solar Plexus (Yellow), Sacrum (orange) and Root (red). The chakras can be stimulated using a variety of methods including certain foods, colours, crystals and sounds. I have focused on sound in my work. These pieces were made using sound waves from binaural beats using specific frequencies associated with the chakras. Binaural beats are a brain response created from hearing repetitive frequencies through auditory input. This kind of stimulation results in a hypotonic response and can also create balance in specific chakras. Many people use binaural beats to enhance and induce deep meditative states. In these deep states, our brainwaves change so that we can create the conditions for healing in our body. Each chakra also has a specific sound associated with it. These sounds are often chanted as mantra to simulate frequencies through vocal output. The most commonly known sound is “aum” which is connected with the 3rd Eye Chakra. 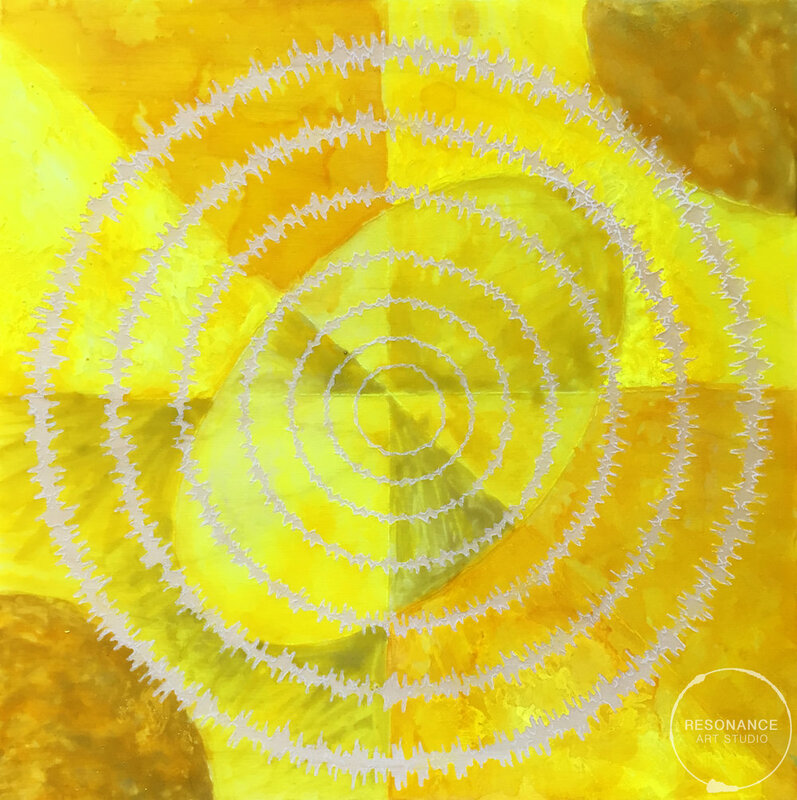 The colour pattern in the background is chosen based on the cymatic diagram associated with the level of hertz used in the binaural beat recording. Cymatics is the study of sound and vibration made visible through the vibration of sand on a plate. As the sound vibrates the plate, the sand moves into a geometric pattern. The change in hertz changes the geometric pattern. Each chakra has a specific hertz frequency range, which can stimulate it. Higher chakras (crown and 3rd eye) are generally vibrating at higher frequencies than lower chakras (root and sacrum). 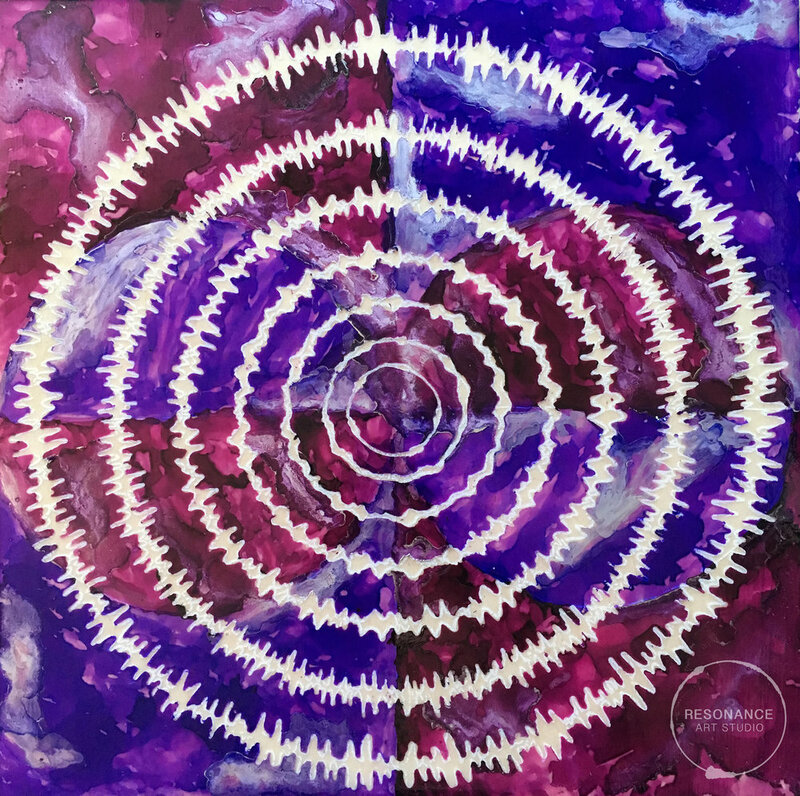 The cymatics patterns I have chosen for the alcohol ink backgrounds of my pieces are based on the musical note that most closely matches the frequency for that chakra. 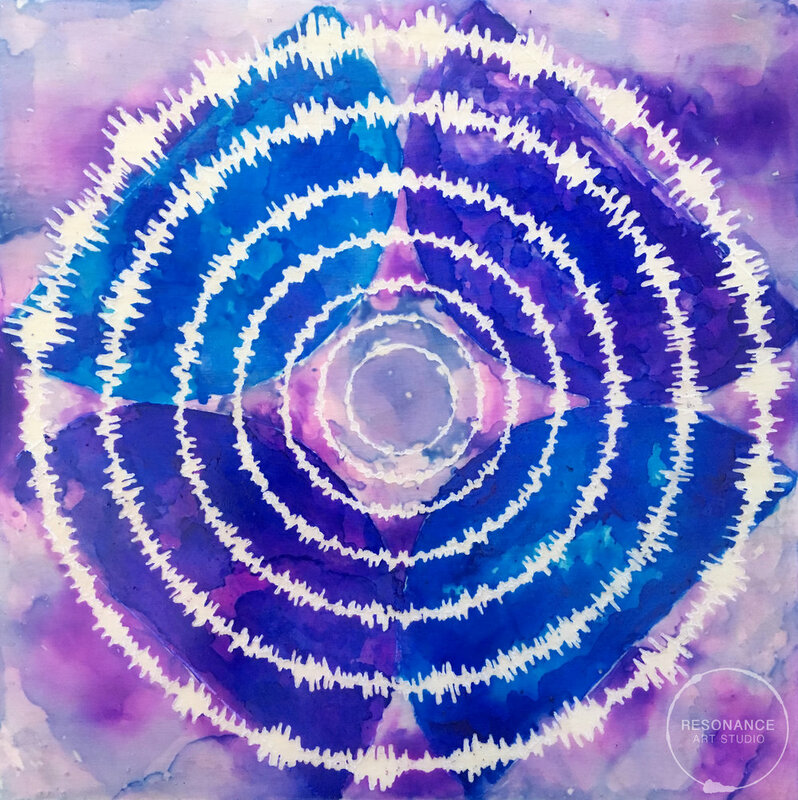 The representation of the sound waves, colour choices, and cymatics pattern all demonstrate the possibility of healing through sound in the chakra centers of the body. The goal of my sound wave art is to make the invisible phenomenon in our world visible, tangible and relatable to others. The abstract concepts of sound and the chakras are synthesized perfectly in my compositions. My hope is that they resonate with you! Which chakra are you most drawn to? Chakra Sound Series will be available next month at Motion Gallery and as prints in the online store. When I try to explain to people what I have been making during my residency at ACAD, I find I am completely devoid of self-consciousness about their reaction. It is as if this artwork has taken on a life of its own and I am no longer the owner of it, but simply the vessel that created it. The themes and ideas I have been working with are the most significant and important in my practice so far. My work is provocative, disruptive and likely controversial. I have had a chance to step back and examine the work I have created from a distance in the last couple of weeks. I have also had the opportunity to discuss my work with a couple of ACAD instructors. In doing this, my ideas and purpose have come together more clearly for me. When you are in the midst of creating it is often difficult to know how everything will come together. As you step back, you can put things into perspective. My goal for my residency was to create art that communicated how an idea spreads through sound, influence, politics and protest. I thought about how I could show how quickly an idea spreads and takes hold in our culture. I have chosen to use images of disease paired with sound waves to portray this idea. Many of the diseases I have chosen are either deadly or result in serious symptoms for the sufferer. Some of the diseases are treatable, but only if the patient has access to quality healthcare. Some of the diseases have stigma attached to them, which results in the sufferer being treated differently as a result of their condition. Disease is a metaphor and a mirror in this work for the way that people are treated in our culture based on their status, opinions and agency. The first four works I completed are light boxes with images of STIs paired with sound waves of misogynistic quotes by Donald Trump. These diseases are illuminated from behind through to show how we must examine misogyny more closely and in critique what leaders in power say. The STIs are paired with these quotes to represent (as metaphor) how misogynistic ideas are perpetuated through the abuse of sexuality through males in power. There is an underling question in the work about how we can protect ourselves against the perpetuation of these misogynistic ideals in society. To make these pieces I had to listen to Donald Trump’s voice over and over again. I find his voice particularly irritating. Part of this irritation comes from the content of his speech. Part of this also comes from the pure sound. I have a condition called Misophonia that affects my experience of sound as a fight or flight response when exposed to certain sounds. The sound of Donald Trump’s voice has become a trigger for me. In making these pieces I have purposefully exposed myself to this trigger and transformed it into something abstract that I can digest. In this way, the work has become a form of therapy. During a critique with Walter May, a sessional instructor at ACAD, the only criticism he could offer me was that the work was “too beautiful.” He asked me how I could reconcile the beauty and aesthetic value of the work amidst its content. I explained that I felt the work needed to be approachable. I want people to be intrigued enough to look deeper and experience the work before being disgusted right away. This is a comment on the way that people tend to accept what they hear from people in power without questioning it right away. I want people to understand how these ideas are perpetuated easily when heard in a particular context. There is an abstraction in my work that comments on how an idea changes as it is passed through society through different people, contexts and lenses. I have taken sound and abstracted it into a sound wave and further into a circle. I have taken images of disease and re-created them with ink to look realistic enough to be mistaken for the real thing. I have then layered these images along with text to further abstract and distort them. Even when being illuminated from behind with the light box, the text is not completely clear. Ideas are passed from person to person in a similar way, coming out the other side distorted and changed from the original message or forgotten completely. Remember the childhood game of telephone? I have placed these petri dishes on a light box that has sound waves of quotes from important politicians and intellectuals from the past. Many of these quotes were controversial at the time. Some of these ideas still exist in our culture, others we have gained some perspective on. The diseases are the similar in this way. Many of these diseases are deadly when the patient does not have access to healthcare, while others can be prevented and treated with the proper resources. This is similar in our culture. These politicians have created theses disease with their ideas and speech and once said, they no longer have power over how they are affect people, spread, and mutate. I had a final critique with Sondra Meszaros, an instructor at ACAD. We had a constructive dialogue about the ideas and concepts embodied in my work. She commented on my concern with the aesthetics of the pieces. We had a discussion about how much of the Trump campaign was not overly concerned with aesthetics, yet people accepted him anyway. We also talked about the success of fascism to use aesthetics to gain support and popularity. She noted they very “scientific” approach to my work and compared it to another ACAD instructor Mireille Perron’s work, The Laboratory of Feminists Pataphysics presents Ateliers of the Near Future. In this performance and found object based piece, Mireille dons a lab coat and wanders the gallery, explaining the collection of objects she has curated as a scientist. This made me think about how I could incorporate performance into my future exhibitions. "What Doesn't Kill You," Alcohol Ink on Petri Dishes, "STIs," Digital Poster, 16"x20," "Deadly Disease," Digital Poster, 16"x20"
We also brainstormed how to label the pieces for maximum scientific “legitimacy” and to maintain a balance between helping the viewer understand and giving away everything. Sondra suggested making a didactic poster with images of my artwork. I took her suggestion and made posters for each piece using images of my artwork and replace “real” definitions of the diseases with the quotes they are paired with. I believe these posters further legitimize the creation of these diseases as the “real thing.” Further emphasizing my point about how people believe ideas told to them in within the context of power and influence. Scientific evidence is often given the most legitimacy in our culture when people are asked to believe something. By making my exhibition appear scientifically legitimate I am imitating these tools to create truth that our culture accepts. The final comment that Sondra made about my work was the absence of “me” in it. She felt that I had personal reasons for making the art, yet she could not clearly see evidence of it. She suggested that I think about making a piece with a more personal revealing of my feelings about these themes. To be honest, this is something I have been struggling with. As reflected in the title of this blog, I have been driven by some inner demons to create this work. These are often hard to reveal in a personal context. It requires a level of vulnerability I am not yet ready to explore. I also wonder how I can include my personal connection while maintaining the universal experience of it for my viewer. I believe these issues are bigger than just my experience. This is something I am going to continue to think about as I make more work in this series. A reflection on the progress made during my ACAD Summer Residency 2017 at the mid-way point. ACAD Summer Residency 2017 Introductory blog is an overview of the ideas I will be exploring in July and August through printmaking, drawing, painting and digital media. This blog explores the social and personal implications of technology on an artist and their work. “Morning Meditation” was made with sound waves from the guided meditation we did every morning in Thailand. The colours were inspired by a flower mandala that was made by students one morning to adorn the centre of our meditation circle. This blog post explores my journey to find meditation and how I use this as inspiration for my artwork. 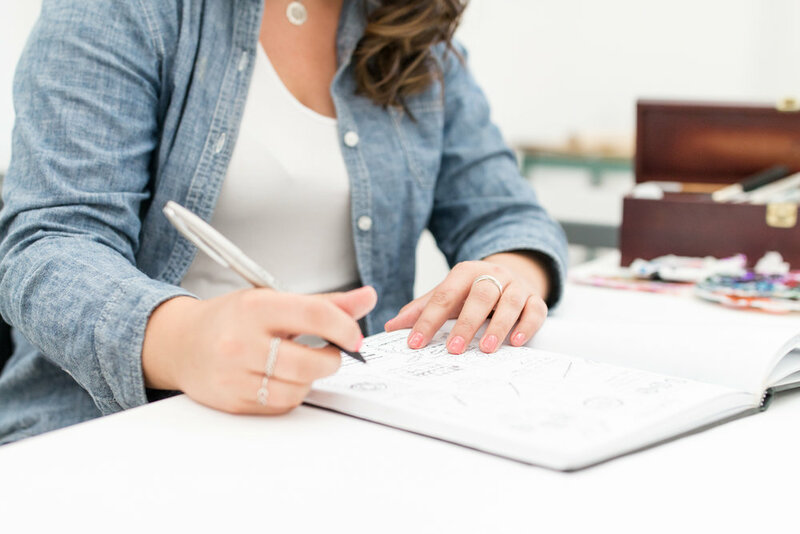 This blog post is a tongue-in-cheek list of how to prepare for an art show. This blog explores my experiences of using alcohol ink. Upcoming show: RAW Calgary Presents "Cusp"
Information about RAW Presents CUSP. 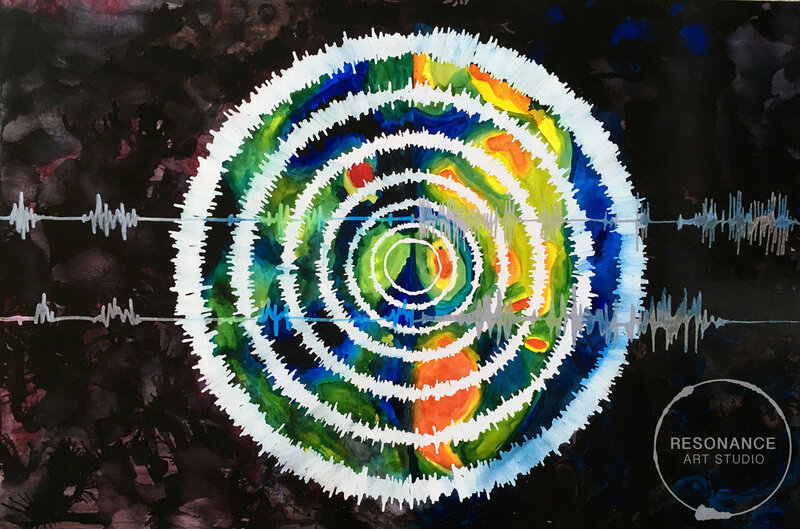 This blog post explores my early inspiration for making sound wave art.